Here is a quick dinner that sounds difficult to make. But it is really easy. Sage is still looking great in our garden with the long, warm fall we have had and it pairs beautifully with butter in about 5 minutes of gentle cooking. The ricotta gnocchi is a little more involved but not much, and if you have ever tried to make potato gnocchi and felt discouraged, redemption is at hand. These are super simple to make. We first ate these when our friends Marjorie and Marian of Orb Weaver Farm made them for us, and we have been hooked ever since. 2 cups whole-milk ricotta (1 pound) Have you had the yummy one from Mountain Home Farm? 10 to 15 whole sage leaves, depending on size. About 1/4 cup. Stir together ricotta, eggs, 1 cup cheese, nutmeg, and 1/4 teaspoon each of salt and pepper. Add flour, stirring to form a soft, wet dough. 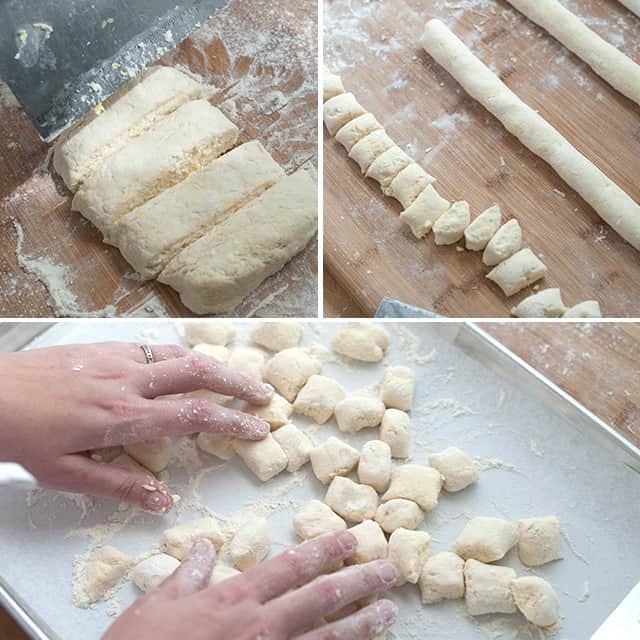 Shape dough on a well-floured surface with lightly floured hands into 2 ropes that are about 1 inch thick. Cut crosswise into 1-inch pieces with a lightly floured knife. Place in 1 layer on a lightly floured parchment-lined baking sheet while you work. Cook gnocchi in 2 batches in a pasta pot of boiling salted water (3 tablespoons salt for 6 quarts water), adding a few at a time to pot and stirring occasionally, until cooked through (cut one in half to check), 3 to 4 minutes per batch. Lift out with a slotted spoon and drain in colander. Meanwhile, cook butter with sage in a 12-inch heavy skillet over medium-low heat until golden brown, about 5 minutes. Gently toss gnocchi with brown butter in skillet and sprinkle with remaining 1/2 cup cheese. Season with salt. For a great photo explanation of this, click on any of these pictures for a link to the "Inspired Taste" website. They do a great job of explaining the simple process. Mulch your garlic. Need a good source of organic straw? Call up Aurora Farms in Charlotte, VT. They grow grains for the Nitty Gritty Grains Company, and their bales of straw are just beautiful - no weed seeds, nice long strands with hollow stems to insulate from the cold, and best of all it is organic. You don't want to risk introducing persistent herbicide residues into the garden. Plant some paperwhite bulbs for forcing. You can find out how right here. Give your houseplants a trim, a feed, a little love. Check them for pests, wipe them off with a little neem oil if you see anything crawling around. This is a great time of year to give houseplants a little shower. The heat source in your house is likely quite dry, and most of your green friends like the feeling of rain. Recreate it for them. You can sing to them, too, while you are at it. Make a few holiday gifts from the garden - herb salts, lavender sachets, cranberry apple chutney, herbal vinegars, calendula skin oil, or rosemary short bread. If you don't have any of the necessary garden ingredients, you can always purchase them and see it as inspiration for growing your own next year. Pinterest and the internet are brimming over with ideas and directions for making all kinds of beautiful holiday treats from the garden. The links above will get you started. Make a garland, wreath or swag with stems, twigs, branches, seed pods, dried flowers, and other goodies from fields, woods and gardens. I love growing a hedge of Ilex verticulata and a small row of red osier dogwood for their berries and twigs make striking additions to winter greenery like balsam or pine or cedar. Poke at the compost pile. Try to introduce some air into its nether parts so that it really heats up before the cold sets in. Add some fallen leaves, and a little manure from a horse farm or friends with chickens. You get the idea. Look at seed catalogs! They are coming out now and the best therapy for December Darkness is those spring dreams of budding life and sowing seeds. Plant bulbs. Watch this video with Charlie Nardozzi if you don't know how. 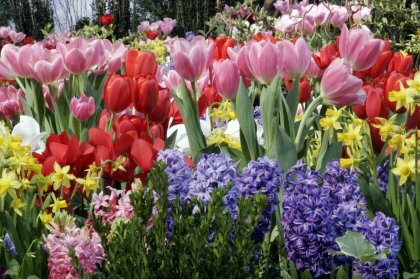 Gardener's Supply in Burlington, Williston and on line, has a great selection of flowering bulbs that will wow you in the spring. Mulch your perennials with leaves. No need to think of leaves as waste...they are loaded with carbon and a perfect way to add organic matter to your gardens. They will offer some winter protection too. Here are some other leafy ideas. Cut back annuals if you have not done so yet. Or leave the sturdier ones such as sunflowers and amaranths since they make lovely perches for song birds. Not everything needs to be so tidy. Weed and cut back perennial beds. 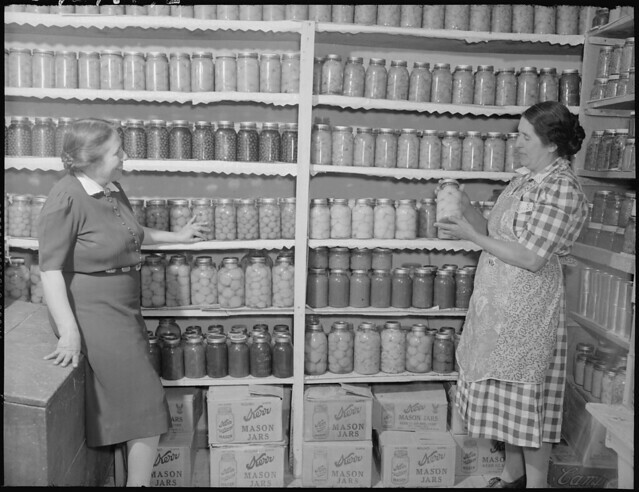 About all that food you diligently canned and froze all summer - start eating it! Let us know what varieties worked well for you. You can contact us through this website. If you want to make a new garden for 2013, now is a great time to mark it, remove the sod, and amend with compost. Clean off tools, oil them, put them away neatly, and feel good about it all. Store garlic and onions in a cool, dark, dry place. Make a pot of potato leek soup. Mulch your leeks and root crops, if you have some in the ground still, with straw, so that you can harvest them after frost comes. Sit by the fire if you have one, light some candles if you don't, and enter the time of contemplation and restoration. Our retail greenhouse is co-owned with a wonderful business also located at the same site. It is Queen City Soil and Stone, owned by Charley Macmartin of Burlington. Not only is Charley one of the nicest people you could ever meet, he is also the talent behind all of the stone work you see in our parking area and our lovely display garden. Charley uses the retail greenhouse as the home of his winter workshop series for homeowners and landscape professionals who want to learn or perfect dry wall masonry. The first workshop in this series is a perfect one for the Red Wagon Plants community since it is focusing on herb spirals. These simple and elegant structures are a great way to plant lots of herbs close to your kitchen door and in such a way that you give each herb the type of micro-climate it craves. Herb spirals provide various conditions in one small space - dry and sunny, shady and moist and everything in between. Queen City Soil & Stone’s series on garden stone features continues in November with a workshop on herb spirals. An herb spiral is a stone wall twisted in on itself creating a garden bed of varying soil depth and planting possibilities from kitchen herbs to strawberries to cut flowers. The workshop will be held at Red Wagon plants in a heated greenhouse on Saturday, November 12, from 9am to 2pm. The cost of the workshop is $50 and space is limited. To sign up, call Charley MacMartin at (802) 318-2411. The workshop will be hands-on: building an herb spiral, discussing herb spiral design and learning about the plantings that a spiraling garden bed allows. The time to get things done in the garden is shrinking. My good intentions are to get lots done this weekend. Here is what I have lined up for this weekend in the garden: Fill the new raised beds that I just put in the back yard. Get soil ready for garlic planting. Finish planting shrubs along the fence line between our yard and our neighbors' new barn. I am planting Ilex verticulata, or winterberry. The bright red berries are a nice contrast against the wooden building and will bring lots of birds to the yard. Add compost to some new flower beds for next year. I have to admit that I don't love frozen vegetables for the most part. So if you have a favorite way to freeze a vegetable from your garden, please share it with me. Here is one I like and eat willingly out of the freezer come the dark days of winter. I want to share this simple thing with you in hopes you might have a similar beloved thing to pass on to me. For some reason, this year has not been a year when I put up a lot of food for winter. A few jars of tomatoes and this amazing thing I will now show you are the only things I have done. No beans, no salsa, no jams, no chutneys. Well there is still time, so maybe I will play catch up and do a plum chutney with the amazing plums passed on to us by our friend, Yvan. The garlic gets planted the previous fall, the onions go in in late April, and everything else goes in June 1. I like to freeze about 10 to 20 quart bags of this ratatouille, so I usually plant about 6 pepper plants (3 Ace and 3 Italia) , 6 San Marzano tomatoes, 6 eggplants (usually a combination of Listada di Gandia, Orient Express, and Hansel), and 1 zucchini plant ( I do two plantings, one June 1 and one July 1 that way the plants are always healthy). Most households do not need more than 1 zucchini plant. Really. Harvest all the veggies, wash them well. And start chopping. This year, I was a bit lazy and bought a few disposable pans to do the roasting. It made for easy clean up, but the veggies did not caramelize as much as they would have on metal or pyrex. Lesson learned. So basically you just chop up all the vegetables into 1" chunks or so. The proportions are different every year, but it is usually about 1 part onions, 1 part peppers, 3 parts eggplant, 2 parts tomatoes, and 2 parts zucchini. I chop everything separately and then add it to the pans. I then drizzle olive oil over every thing. Add lots of salt, good sea salt is best, and then handfuls of chopped herbs to each pan. I like a blend of thyme, oregano, and rosemary. But other combinations work well. Preheat the oven to 375F and slide in the pans. Turn and toss every 20 minutes, until everything is cooked and starting to caramelize. The overall cooking time really depends on the amount you are doing, the type of pan you are using, the thickness of the vegetable layer in each pan, etc. Basically, cook it until the whole house smells really good and the veggies are very soft and starting to brown. If I were making this for a meal to be eaten that night, I would do a single layer, in pyrex, and let it get golden brown. This is much harder to do in big batches in a home oven, and since freezing compromises texture and flavor anyhow, I think of these roasted veggies as additions to other recipes all winter long, not the main showcase in a meal. Once everything is cooked, let it cool down completely, and then carefully scoop it into plastic quart-sized freezer bags. I usually use a measuring cup and one of those funnels for jars, since it makes life a little easier. Once frozen, the veggies can be used in pasta sauces, on pizza, in lasagnas, in soups and stews, as fillings in calzones, or as a topping for polenta, etc. You get the picture. It's such a nice way to have a little taste of summer in the winter and uses up so much of that amazing garden produce. Even in a summer like this one, when I have had to take some time away from gardening and preserving, I made sure to do some of these roasted veggies for the freezer. Frost Dates in Vermont - South Hero is the Winner! If it is a really early frost, (September in Hinesburg), I will harvest all the ripe fruit on the heat loving plants (squashes, tomatoes, peppers, eggplant, etc) and if the plants still look healthy and have lots of unripe fruit, I will cover the plants with row cover. You can use sheets, blankets, plastic sheeting, etc. If the frost is coming at a later point, I often won't bother with the plant protection - just harvest all the fruit (green tomatoes can ripen indoors) and call it a day! I don't bother to protect lettuce unless the first frost is very cold and very early. Lettuce can handle a few light frosts, so it is usually not a problem early on. Later in the season, I set up some simple wire hoops and keep the lettuce under row cover for the remainder of the season. This allows fresh lettuce to be harvested for salads well into November. It is good idea to seed or plant fresh lettuce in late summer and early fall so that the protected plantings of fall are fresh and tender. It is not really worth it, from a culinary perspective, to keep old or bitter lettuce alive. Plus it won't do as well if it is past its prime and won't fend off the cold like a younger planting can. Hardy greens like kale, mustard greens, collards, etc do not need row cover and can live, unprotected, into December. You can always put some sort of protection over them in November to increase the harvest period past December, but it can be difficult to do with the taller plants. The wind dessicates them and makes them unappealing, and without a larger structure like a cold frame or mini-greenhosue, it can be difficult to give them adequate shelter. All these attempts at fall crop protection will leave you grateful for the sweet rewards of fresh salads, tomatoes coming out of the cellar ripened and tasty, and nutritious leafy greens sweetened by the kiss of cold. “Overwintered” is a term used to describe a vegetable that is planted in the spring, summer or fall of one year in order to be eaten in the spring of the following year. This is a great way to extend the growing and eating season in our Vermont climate. Overwintered crops generally are dormant all winter long and then come back to life with the lengthening days and warming temperatures of spring. Overwintered Spinach - Not all vegetables can survive our VT winters, but the few that can include spinach, parsnips, leeks, garlic, and parsley. Spinach for early spring eating (mid to late April) should be sown in the first two weeks of September. Once it germinates, allow it to grow without harvesting or touching it. You can eat a little if you want, but ideally you will leave as much of the plant in the ground as possible. Once very cold weather hits, in early to mid-December, you can protect the spinach under a layer of straw, or leaves, or a few layers of thick row cover (Reemay or Agribon can be found at Gardeners’ Supply Company or ordered online at Johnny’s Selected Seeds). In the early spring, as soon as the ground has thawed out, remove the layers of protection and you will see the spinach slowly coming to life, long before any other plants begin to stir. It won’t look like much at first, but will quickly grow to be the size of spinach planted during normal times. It will be extra sweet from having survived the cold and will be incredibly rewarding - a truly vibrant food. This is such a delicious treat for early spring and really worth the trouble. Overwintered Parsnips- parsnips are a long season crop. They are best when planted in very early spring and harvest the following year. This allows them to grow to a good size and then sweeten up with the cold temperatures. Plant the strange looking seeds in shallow trenches, ¼ inch deep (that is NOT very deep!). Keep well watered and well weeded all summer long. In the fall, you can harvest a few of the larger parsnips to eat September through December, but be sure to elave a few for spring time meals. Once the ground is frozen, in later December, mulch heavily with a layer of straw. The straw moderates the soil temperatures and prevents the soil from buckling and heaving with the freeze and thaw cycles. Pull off all of the mulch as soon as the ground thaws, and then in late April and early May, you can dig up huge, sweet roots that are a lovely addition to spring time soups, roasted vegetable dishes and purees. Leeks are another crop that is planted very early in spring - mid to late April is ideal. The small and slender plants are planted in trenches, about 6 to 8 inches apart in rows that are 12 inches apart. Keep leeks well watered and weeded. Once they are about 10” tall, you can fertilize them with a good organic fertilizer such as Pro Gro from North Country Organics or Compost Plus from Vermont Compost Company. Then hill up the plants with soil from in between the rows. A good hoe makes this job much easier. The more you hill, the larger the plants will be. This allows for more of the white, edible portion to grow. Hilling also helps to keep the moisture even, another condition which encourages bigger growth. You can hill leeks one more time before fall, in early August or so if you choose to. If you cannot eat all of your leeks in the fall, leave a few in the garden for overwintering. 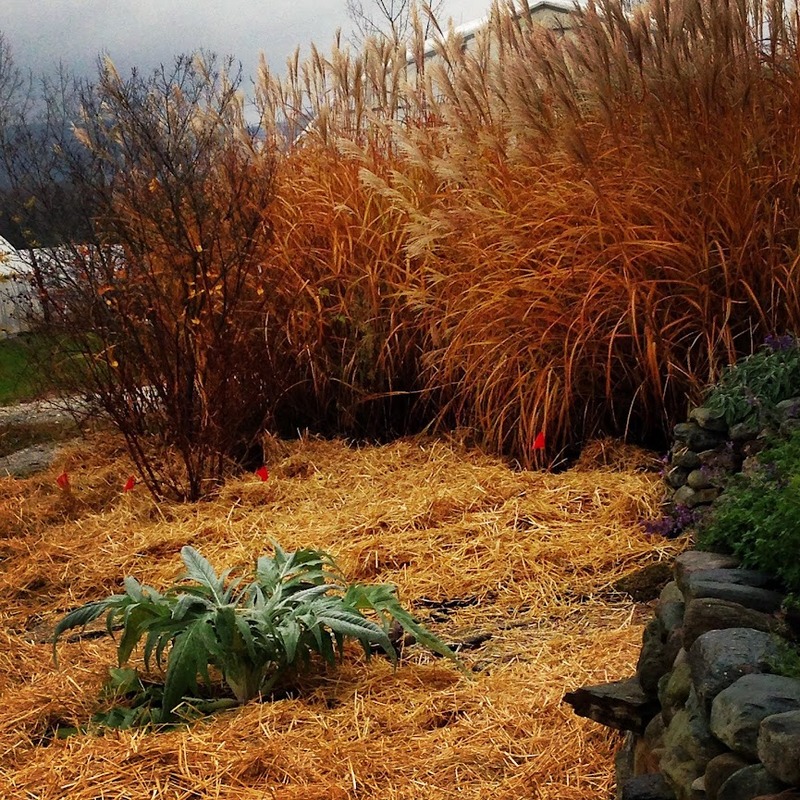 Mulch well with straw (about 6” in depth) and let sit in the garden all winter long. On warmer winter days, you may be able to still harvest some of the leeks if the ground has not frozen solid under the mulch. With whatever leeks are left in the ground come snow melt, pull off the mulch and wait to see what happens. Not all leeks will have successfully lived through the winer, but about 40 to 60% should if you have followed these steps. You will see some yellow and rotting foliage with fresh green growth poking through. These are the leeks that have made it through winter. Let them size up a bit before harvesting. They will come back to life and can be picked and eaten in later April or mid-May. You will have to peel back some of the outer layers, but underneath will be a luscious, silky treat. So sweet in spring, and a great addition to soups, vegetable tarts, or braised meats. Other crops: I have had good luck with late seedings of lettuce, scallions, cilantro and dill. These all overwintered fine and were good for a few salads in very early spring before they decided to go to seed. The lettuce varieties that I have found to be most well adapted to overwintering are Merveilles des Quatres Saisons, a beautiful French heirloom variety, and Tango, a green oakleaf. You can also plant shallots and garlic in fall for early harvests. Green garlic is an immature head of garlic that tastes milder than its full grown version. Parsley is a biennial and will also come back to life in the spring before it goes to seed. Biennials make a flower in their second year, so this is normal plant behavior! Remember, every winter is different. This type of growing requires flexibility, observation, and a willingness to experiment. Exact planting and harvest dates are not easily determined because they are a function of weather, where you garden is sited, and micro climates. The best way to understand overwintering is to start doing it, and see what works well for you. Observe each crops natural life cycle, and learn to work with it in the context of our long and cold winters. There is no better way to say “Hello, Spring!” than by harvesting your first salads in April when green life is just beginning to stir. Mid-August is rolling around, and with it comes some vegetable planting possibilities that will feed you late into autumn and early winter. This is a great time to clean out some of the garden beds that have finished producing and replant them with some fresh crops for late season harvest. Here are a few options that you might want to consider incorporating into your later summer gardening routine. A note on flea beetles and row cover. Flea beetles are little, black and jump around on your plants while making tiny little holes. They love anything in the brassica family - cabbage,broccoli, arugual, mustards, collards, etc. Row cover is a white fabric used to keep out insects and/or to warm up the soil and air around the plants. It does not hurt to use row cover to speed things along and to keep out the flea beetles. Broccoli - seed a small amount directly into garden beds, or buy transplants up to mid-August. If you are direct seeding into a garden bed, remember to thin or prick out and replant the broccoli babies so that they have proper spacing (15” or so). Cabbage - same as broccoli. Choose shorter day varieties. Seed packets usually list the days to maturity for all crops. In early August, you can usually get away with planting a 60 day cabbage that will be ready in early October. Kale - this is a great time to put in a few more kale plants or seeds, they will size up before snow flies, and will withstand lots of wintery weather. The good thing about kale, is that once it is full grown, it will just stand around in the garden waiting to be picked. It does not get “too old” or bolt (jump into seed production mode). This makes it a great early winter crop and a joy to harvest under snow fall. Collards can be treated this way as well. Arugula - a nice addition to salads, this tender green with a mustard-like flavor is also a great survivor of cold temperatures. It can withstand many hard frosts and will continue to add a little spike to your salads well into November and December. You can put row cover on it to keep away the flea beetles and to give it a little extra protection from cold winds that can dry it out. If it starts to turn a little purple in the colder temps, don’t worry about it, it is still fine to eat. This is just a symptom of not being able to absorb phosphorous in cold conditions. Turnips - a short season salad turnip can still be sown in August. I like the Hakurei variety from Johnny’s. It is delicious raw in salads, sliced thinly or finely diced, or sauteed in a little butter with fresh herbs (winter savory makes a special appearance at my house, often in this dish in particular). People who think they hate turnips will just be shocked when they taste these buttery slices that just melt in your mouth. Spinach - in the first half of August, it is a good idea to plant a large patch of spinach. It will germinate in the cooler night time temperatures (spinach does not like to germinate in the heat) and will last a long time in the field in the cool temperatures of October and early November. Carrots - fall carrots are best seeded right around July 4th. This gives you a chance to do an early batch of carrots for late spring, early summer eating, and then a second (or third) batch for fall eating. Fall carrots are considerable sweeter than spring seeded carrots and are definitely worth the trouble. Boc Choi - this is another crop that does really well in the cooler temperatures of fall. It is not a heat lover, and therefore should only be planted in April and May and then again in mid to late August for fall harvest. This benefits from row cover if you have a lot of flea beetle pressure. There are quite a few different versions of boc choi, and if you like the crunchy texture and delicate flavor of this crucifer, then please consider trying baby boc choi, red boc choi, or full sized boc choi. While it is easier to start with plants, it is certainly possible to direct seed this crop. Beets - fall time beets are sweet, tender, and do not have that “dirt” taste of beets grown in full summer heat. Last planting date for fall beets is around August 10th. They should be direct seeded in the garden and then thinned to one plant per 2 to 3 inches. You can space the rows 10 to 12 inches apart and fit about 3 rows in an average bed with a 4 ft width. The greens are tasty too, and the little delicate plants you pull out when thinning are a great addition to sauteed greens, soups, or even salads if very young. Cilantro and Dill - these herbs can be planted directly in the garden from seed as late as mid-August. They grow well in the cold, and actually prefer it. The cold slows them down and prevents them from going to seed. Plant a good sized patch since you can harvest the plants well into December. They can take a frost, a snow fall and still will bounce right back. Mustard Greens - these can be planted just like arugula. See instructions above. Radishes - are a great addition to the late season garden. They can be planted right up to early September, and will maintain a high level of quality right up until it snows. Lettuce - you can direct seed certain varieties of lettuce for fall harvest. Some do better than others in the cold. I like to plant Merveilles des Quatres Saisons and Tango for their beauty, taste, and cold hardiness. Parsley - this herb can take very cold temperatures, so make sure, in mid-July or so that you have a nice patch of this going into fall and later summer. If this is an herb that you use frequently, it does not hurt to plant two or three different patches over the course of later April to mid - July. It is a slow grower, so after mid-July you can only plant it from transplants, not seed. Things to Plant Now. You Will be Glad You Did. August is rolling around, thundering ahead, and with it comes some vegetable planting possibilities that will feed you late into autumn and early winter. This is a great time to clean out some of the garden beds that have finished producing and replant them with some fresh crops for late season harvest. Here are a few options that you might want to consider incorporating into your later summer gardening routine. - seed a small amount directly into garden beds, or buy transplants up to mid-August. If you are direct seeding into a garden bed, remember to thin or prick out and replant the broccoli babies so that they have proper spacing (15” or so). - same as broccoli. Choose shorter day varieties. Seed packets usually list the days to maturity for all crops. In early August, you can usually get away with planting a 60 day cabbage that will be ready in early October. this is a great time to put in a few more kale plants or seeds, they will size up before snow flies, and will withstand lots of wintery weather. The good thing about kale, is that once it is full grown, it will just stand around in the garden waiting to be picked. It does not get “too old” or bolt (jump into seed production mode). This makes it a great early winter crop and a joy to harvest under snow fall. Collards can be treated this way as well. A note on flea beetles: It does not hurt to use row cover to speed things along and to keep out the flea beetles. They are little biting insects that make little holes in the leaves and generally slow down a plant’s growth by stressing it a bit. All vegetables in the brassica family are susceptible to flea beetles - broccoli, kale, cabbage, mustards, arugula, collard greens, and boc choi are all in this family. a nice addition to salads, this tender green with a mustard-like flavor is also a great survivor of cold temperatures. It can withstand many hard frosts and will continue to add a little spike to your salads well into November and December. You can put row cover on it to keep away the flea beetles and to give it a little extra protection from cold winds that can dry it out. If it starts to turn a little purple in the colder temps, don’t worry about it, it is still fine to eat. This is just a symptom of not being able to absorb phosphorous in cold conditions. - a short season salad turnip can still be sown in August. I like the Hakurei variety from Johnny’s. It is delicious raw in salads, sliced thinly or finely diced, or sauteed in a little butter with fresh herbs (winter savory makes a special appearance at my house, often in this dish in particular). People who think they hate turnips will just be shocked when they taste these buttery slices that just melt in your mouth. - in the first half of August, it is a good idea to plant a large patch of spinach. It will germinate in the cooler night time temperatures (spinach does not like to germinate in the heat) and will last a long time in the field in the cool temperatures of October and early November. Overwintered Spinach - overwintering means keeping a vegetable alive through the winter for spring harvesting and eating. Not all vegetables can survive our VT winters, but the few that can include spinach, parsnips, leeks, garlic, and parsley. Spinach for early spring eating (mid to late April) should be sown in the first two weeks of September. Once it germinates, allow it to grow without harvesting or touching it. You can eat a little if you want, but ideally you will leave as much of the plant in the ground as possible. Once very cold weather hits, in early to mid-December, you can protect the spinach under a layer of straw, or leaves, or a few layers of row cover. In the spring, as soon as the ground has thawed out, remove the layers of protection and you will see the spinach come to life, long before any other plants begin to stir. This is such a delicious treat for early spring and really worth the trouble. A future post will be just about overwintered vegetables, so if this is something you have been wanting to try in your garden, check back here in a few days! are good herbs for fall planting since their cold-hardiness is unmatched, and it will give you something to add to autumn salsas, salads, and pickles. Just sprinkle some seed into a shallow trench, press them in, and lightly cover with soil. The planting depth is very shallow here, just 1/4 inch or so. One of the most common problems with crops seeded directly into garden soil, is that they get planted too deeply. Remember this basic rule of thumb: the seed needs to be planted only 2 times deeper than its own size. Cilantro and dill will live until the first snow! They thrive in the cold. They are true soldiers of season extension. Let us know if you feel inspired to try your hand with some of this season extension - we love to hear about it! Extra! Extra! 85 pounds of food from one plant. This needs only a green salad. It's a hearty dish. Add squash to a butter or oiled 9 x 13" baking dish. Toss in the onion and sage mixture, the cream, and salt and pepper to taste. Use your hands or utensils to get a good blend of all the ingredients. Cover with foil and bake in preheated oven for about 40 minutes. Take out the dish, remove the foil, turn up the oven to 450, cover squash with the cheddar cheese and return to oven until brown and bubbly, about another 20 to 30 minutes. You can even turn on the broiler for a minute or two at the end to really make the top brown. This freezes well. It's great for potlucks and any other time you want to feed a crowd. With these colder days also come a chance to produce a few more late season greens in the vegetable garden. These include lettuce, kale, parsley cilantro, arugula, mustard greens and spinach. Here is a simple system that can be followed by anyone wishing to extend the fall and winter harvest.